Two weeks ago was the annual Gathering of the Nortons at Washington's Crossing. The gathering is pretty unique in that it's not a show, it's literally just a gathering. But the turnout is usually great and all types of riders come to see who or what, rather, has shown up. My favorite bike this year wasn't a Norton. 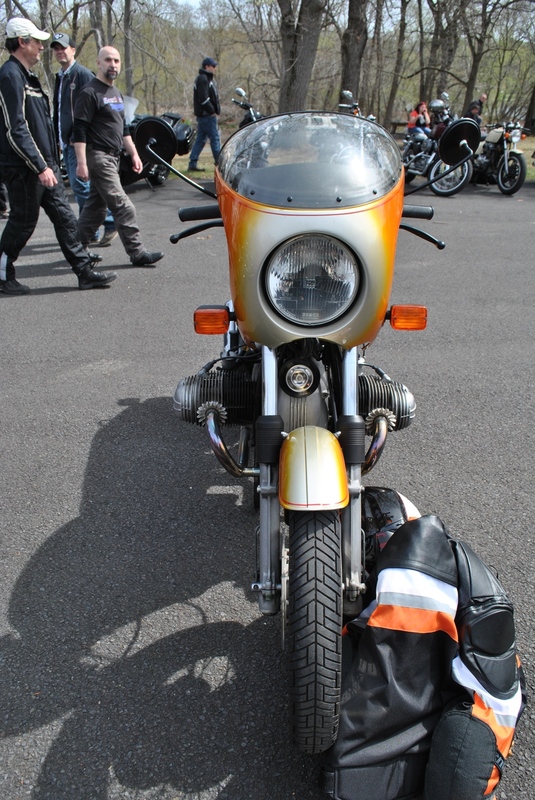 It was a BMW R90S with an orange body. I didn't get to speak with the owner, so I'll let the pictures tell the bike's story. We knew the ride there would be cold and that if we left from the city, we would probably wind up waking up late and taking I-95. But I-95 is rampant with potholes and jerk drivers, so we opted to leave the evening before and camp at our friend Justin's house since it was close to the meet. The ride out to Justin's house was perfect. It was one of the first warm Saturdays we had seen here in Philly and it was nice to just cruise along the back-roads up to South Hampton. While I wouldn't really consider sleeping in a friend's backyard true camping, we had fun and got to enjoy a fire with some Jiffy Pop and a few beers. As suspected, the ride the next morning was cold. Dan, Justin and I rode with Justin's family friend, Joe, and Justin's mom on the back. At the gas station that morning, she hopped off of his bike to tell me how cute I looked on my bike. Oh, moms. On the way to Washington's Crossing Dan's bike kept putting out at stops. In fact, his bike putted out at almost every stop. It was disconcerting to say the least because he had been riding his bike for two months prior with no issues after replacing the cam and putting on a 'new' exhaust. But, I guess that's how 40 something year-old Shovelheads are. As we arrived at the meet, I noticed that Dan was also holding on to his tank when he wasn't shifting. His Shovelhead is hand-shift, so that was alarming to watch. Sometimes, riding with people you care about makes for more trouble than not. When we arrive he tells us that his tank is coming off. More specifically, the bolt that keeps the bottom tab on his tank bolted to the frame is now loose. So we think- motorcycle meet, someone's got to have some tools. In fact, we hear this echoed over and over again from everyone that we meet. Sorry man, I don't have any but someone probably does. After about an hour and a half of asking around, Dan found someone with a standard allen key set and we were good to go. Or so we thought. A few minutes after leaving, we see an older gentleman on the side of the road pushing his Triumph. We all look back at one another and motion to stop. Apparently, he has run out of gas. It's hard to hear anything else over the rumble of our three bikes and every other bike that is passing, but we tell him that we will get him some gas and be back soon. As we take off, we see him cross over to a safer side of the road. The closest gas station that we know of involves riding through Main Street in New Hope. If you've never been, don't go on a day where there is a bike event nearby. It's dead-stop traffic and there are people and bikes and cars everywhere. We finally get to the gas station and the attendant looks the other way as we fill up a bottle that used to contain water. We ride back through the traffic, which is a little better going the other way, and we find our guy. He insists on giving Justin money for gas. It's sweet, but unnecessary. We know what it's like, so we stopped. It's pretty simple. But in retrospect, I guess he was pretty surprised to see us stop out of all the riders passing by that day. Dan, on his '74 rigid Shovelhead with a jockey shift; Justin, on his '62 Pan-Shovel with an upside-down cross on the sissy bar and a girl he very recently met on the back; me, with my little yellow-tanked Sportster and my tassels just flowing in the wind. Either way, we got back on our bikes so that we could make our way through New Hope to find some good roads to ride. We didn't get very far. Between the traffic and all the chaos, a few young cops were out and about. I guess they thought it was a beautiful day to pull some 'bikers' over. Three Harleys are loud whether or not they individually exceed the set-forth decibel limits in a given city. And when on of them is old, and its carb plug has popped off, it's even louder because you've pulled out the choke to make it idle higher instead of stalling out at every light. Can you restart it? as the cop who pulled us over asked. Well sir, if you want me to (kick) start it again, we're going to be here for a while. We wound up getting off with a warning, as I'm sure everyone else did that day. On the way back to Philly, two of the three bolts came loose on Dan's shift-plate and people gawked at us at every light as his bike idled higher. By the time we hit Jenkintown, we both needed a break. I was cold and stressed and he needed to 'fix' a few things.